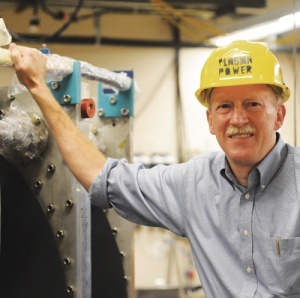 Controlling high-temperature matter in the laboratory and studying the behavior of magnetized plasma to predict space weather and to achieve cost-effective fusion energy. My primary research interests are of the impact of these instabilities on magnetic confinement, and the analysis of the role of instabilities on the design of thermonuclear power plants. By conducting controlled experimental studies using a variety of magnetic confinement devices, we are attempting to further our fundamental understanding of the linear and nonlinear dynamics of microscopic and macroscopic plasma instabilities. The results of the experiments are applied to both man-made plasma confinement devices, such as future thermonuclear fusion plants, and to plasmas confined in planetary magnetospheres. I am involved with two major experiments in Columbia's Plasma Physics Laboratory and with several experimental efforts at the national Plasma Physics Laboratory at nearby Princeton and at the General Atomics DIII-D tokamak located outside San Diego. At each location, large high-beta tokamak devices are used to study the operational limits for fusion-relevant plasma discharges. In the high-beta tokamak experiment at Columbia (called HBT-EP), we combine detailed magnetic measurements, taken at several locations within the tokamak discharge, with sophisticated numeric techniques in order to correlate our observations with the theoretical predictions of ideal magnetohydrodynamical (MHD) equilibrium and linear stability. Direct measurements of the growth and saturation of pressure and current-driven kinks are possible, thereby testing the theories used to design much larger fusion devices. I am particularly interested in discovering the use of active and passive plasma control techniques to make the fusion reactor smaller and more economical. My research is also directed to understand the fundamental processes involved with collisionless transport of plasma trapped within planetary magnetospheres. At Columbia, we have created the first "artificial radiation belt" by creating an energetic population of electrons trapped around a large, steady-state magnetic dipole, or terrella. A rich and evolving spectrum of intense low frequency fluctuations enable us to make controlled measurements of non-linear particle dynamics, precisely identify the onset of particle chaos, and establish basic principles of plasma transport. This last experiment is particularly exciting since we are measuring the phase-space properties of low-frequency induced diffusion for the first time in a dipole magnetic field. We hope to establish the conditions when fully chaotic diffusion preserves the adiabatic pressure-density relationship. In this case, wave-induced particle diffusion can lead to inward transport which compresses and heats the magnetoplasma. "Turbulent fluctuations during pellet injection into a dipole confined plasma torus," D.T. Garnier, M.E. Mauel, T.M. Roberts, J. Kesner, P.P. Woskov, Physics of Plasmas 24, 012506 (2017). "Improved feedback control of wall stabilized kink modes with different plasma-wall couplings and mode rotation," Q. Peng, J.P. Levesque, C.C. Stoafer, J. Bialek, P. Byrne, P.E. Hughes, M.E. Mauel, G.A. Navratil, D.J. Rhodes, Plasma Physics and Controlled Fusion, 58(4), 045001 (2016). "Imaging free-falling particles for multipoint measurement of plasma fluctuations," T.M. Roberts, M.E. Mauel, M.C. Abler, B.K. Makansi, Rev. Scientific Instr., 86(8) 083510 (2015). “Local Regulation of Interchange Turbulence in a Dipole-Confined Plasma Torus using Current-Collection Feedback,” T. M. Roberts, M.E. Mauel, and M.W. Worstell, Physics of Plasmas, 22 055702 (2015). “Active and passive kink mode studies in a tokamak with a movable ferromagnetic wall,” J.P. Levesque, P.E. Hughes, J. Bialek, P.J. Byrne, M.E. Mauel, G.A. Navratil, Q. Peng, D.J. Rhodes and C.C. Stoafer, Phys. of Plasmas, 22 056102 (2015). “High-Speed Imaging of the Plasma Response to Resonant Magnetic Perturbations in HBT-EP,” Sarah M. Angelini, Jeffrey P. Levesque, Michael E. Mauel, Gerald A. Navratil, Plasma Phys Controlled Fusion., 57, 045008 (2015). “Pressure profiles of plasmas confined in the field of a magnetic dipole,” M.S. Davis, M.E. Mauel, D.T. Garnier, and J. Kesner, Plasma Physics and Control Fusion, 56(9), 095021 (2014). "High resolution detection and excitation of resonant magnetic perturbations in a wall-stabilized tokamak," David A. Maurer, Daisuke Shiraki, Jeffrey P. Levesque, James Bialek, Sarah Angelini, Patrick Byrne, Bryan DeBono, Paul Hughes, Michael E. Mauel, Gerald A. Navratil, Qian Peng, Dov Rhodes, Nickolaus Rath, and Christopher Stoafer, Phys. Plasmas 19, 056123 (2012). "High-speed, multi-input, multi-output control using GPU processing in the HBT-EP tokamak, Fusion Engineering and Design", N. Rath, J. Bialek, P. J. Byrne, B. DeBono, J. P. Levesque, B. Li, M. E. Mauel, D.A. Maurer, G. A. Navratil, D. Shiraki, Fusion Engineering and Design, online May 2 (2012). "The high beta tokamak-extended pulse magnetohydrodynamic mode control research program", D. A. Maurer, J. Bialek, P. J. Byrne, B. De Bono, J. P. Levesque, B. Q. Li, M. E. Mauel, G. A. Navratil, T. S .Pedersen, N. Rath and D. Shiraki, Plasma Phys. Control. Fusion 53, 074016 (2011). "Turbulent inward pinch of plasma confined by a levitated dipole magnet," A.C. Boxer, R. Bergmann, J.L. Ellsworth, D.T. Garnier, J. Kesner, M.E. Mauel, and P. Woskov, Nature Physics, 6, 207-212, January (2010). "Global and local characterization of turbulent and chaotic structures in a dipole-conﬁned plasma," B.A. Grierson, M.W. Worstell, and M.E. Mauel, Phys Plasmas 16, 055902 (2009). "Confinement improvement with magnetic levitation of a superconducting dipole," D.T. Garnier, A.C. Boxer, J.L. Ellsworth, J. Kesner, and M.E. Mauel, Nucl. Fusion, 49, 055023 (2009). "A Kalman filter for feedback control of rotating external kink instabilities in the presence of noise," J.M. Hanson, B. De Bono, J.P. Levesque, M.E. Mauel, D.A. Maurer, G.A. Navratil, T.S. Pedersen, D. Shiraki, R.W. James, Phys Plasmas, 16, 056112 (2009). "Production and Study of High-Beta Plasma Confined by a Superconducting Dipole Magnet," D. T. Garnier, A. Hansen, M. E. Mauel, E. Ortiz, A. Boxer, J. Ellsworth, I. Karim, J. Kesner, S. Mahar, A. Roach, Phys. Plasmas, 13, 056111 (2006). "Stable High Beta Plasmas Confined by a Dipole Magnetic Field," D. T. Garnier, A. Hansen, M. E. Mauel, E. Ortiz, A. Boxer, J. Ellsworth, I. Karim, J. Kesner, S. Mahar, A. Roach, Phys. Rev. Lett., (2005). "Dynamics and control of resistive wall modes with magnetic feedback control coils: experiment and theory," M. E. Mauel, J. Bialek, A. H. Boozer, C. Cates, R. James, O. Katsuro-Hopkins, A. Klein, Y. Liu, D. Maurer, D. Maslovsky, G. Navratil, T. Pedersen, M. Shilov, and N. Stillitis, Phys. Plasmas (2005). "Observation of Centrifugally Driven Interchange Instabilities in a Plasma Confined by a Magnetic Dipole," B. Levitt, D. Maslovsky, M. Mauel, Phys. Rev. Lett. (2005). "Suppression of rotating external kink instabilities using optimized mode control feedback", A. Klein, D. Maurer, T. Pedersen, M. Mauel, G. Navratil, C. Cates, M. Shilov, Y. Liu, N. Stillitis, and J. Bialek, Phys. Plasmas (2005). "Helium-catalyzed D-D fusion in a levitated dipole" Nucl. Fusion 44:193–203 (2004).